We are manufacture of fancy designer embroidery work and additional work Sarees. 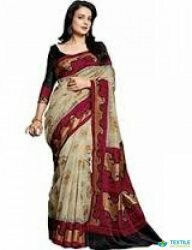 We have so many designer collections of Sarees. We make best quality fabrics Sarees which is gives more classic look. We serve you with the unique print on a platter of new colors soaked with mesmerizing designs. Bahubali Prints Pvt Ltd 3001,3 Floor Kohinoor Market, Ring Road, Surat, Gujarat, India.